Socialist leader and former MP Kishan Patnaik passed away here on Monday following a brief illness. He was 74.Patnaik was admitted into the Nilachal Hospital here five days ago after suffering from fever and was subsequently shifted to the ICU as his condition worsened.Hospital sources said Patnaik, who is survived by his wife, had an attack of meningitis. The end came at around 12.30 PM.The leader, who was elected to the Lok Sabha from the Sambalpur constituency in 1962, was involved in several popular agitations and often highlighted the plight of farmers and poverty in the western districts.His body was taken to the Lohia academy here where it would be kept till tomorrow for people to pay their last respects.Mr Patnaik, a disciple of socialist thinker Ram Manohar Lohia, was very popular among old socialists of Karnataka. M D Nanjundaswamy and former Karnataka Backward Class Commission Chairman Ravivarma Kumar were among his friends. He was involved in many farmers' movements, including that of the Karnataka Rajya Raitha Sangha. He was in Bangalore last month to participate in a seminar on parallel politics organised by the D R Nagaraj Memorial Trust. Senior socialist Kishan Patnaik, who passed away in Bhubhaneshwar on Monday, had some memories of Mysore City, reports DHNS from Mysore. During the Emergency, Patnaik had gone underground in the City to avoid police arrest. He lived clandestinely in the City by changing his name to `Krishnaprasad'.Writer Sriram, who was also part of the socialist movement, told Deccan Herald that Patnaik was in Mysore in July-August when the Emergency was declared. "Patnaik was in my house for two days. "Since police had an eye on my house during that time, he was shifted to a lodging on Ramavilas Road. He stayed secretly in that lodge for over two weeks," he recalled. "Several political leaders secured political posts after Emergency. But Patnaik did not like this and never sought anything after the Emergency," Sriram remembered. Since Patnaik was against alcohol like Dr Ram Manohar Lohia, he used to like soups, he recalled. The organizations and movements connected with the National Alliance of People's Movements (NAPM) condole the sad demise of our ideologue-activist comrade Kishen Pattanayak, on September 27. With his demise, peoples' movements all over the country have lost one of their foremost ideologue and guide. Kishen ji has been a constant source of insight, inspiration and action for scores of the activists involved throughout India. In him we all saw a model of organic intellectual, with a constant interface between the theory and practice. The fact that he came to Bhubaneshwar, and was admitted to a hospital in Bhuvaneshwar - after attending one seminar-workshop faraway from Orissa, speaks for itself. He was diagnosed with pneumonia and bacterial meningitis. Despite his frail health, he would travel, discuss, and participate in various endeavours. Interaction with the organizations, movements and activists of all the age groups has been a life-long passion with Kishen ji. These interactions along with his own uncanny analysis of present situation, his experiences, history and theory would form the basis for his formulations, which he would present before the people in his lucid and precise language. Without any frills or rhetoric he could convince the audience with his propositions on the basis of its impeccable logic and its clear interpretation. He was a model political activist - right from the ideology, presentation, spick and span appearance and approach to the people. He was accessible, affable without becoming verbose. Right from his language, his ideas, his dress - he personified dignified and affable elegance. Kishenji's life-long passion about the equality, democracy and sustainable development used to reflect in his speeches, his prolific writing in Hindi, English and Oriya. Like all true activists, he believed in and practiced the triad of action-theorization-propagation as prerequisite for effective social-political change. His classic work like ''Bharat Shudron ka Hoga' (Shudras Shall Inherit India) and 'Vikalheen Nahin Hai Duniya' (The World is not without Alternatives), best reflect his ideology. He was exploring the future shape of the Socialism Socialist politics in India. He was a political activist-thinker, who recognized the worth of politics by the non-party movements, even while insisting on the need to participate in the parliamentary or party politics. He was in forefront in the formation of the NAPM and latter the People's Political Front. In fact, he was a part of every genuine effort to bring out the radical transformation in the polity. Kishen Pattnayak was born in 1930 into a lower middle class family in Kalahandi, Orissa. After graduating from Nagpur, he joined the Socialist Party and became its 'full-timer' at the age of 22. He was asked to work in the youth wing of the Party, Samajwadi Yuvjan Sabha, and soon rose to become its National President. At the age of 32 he was elected to Lok Sabha from Sambalpur in Orissa. He was one of handful members who turned the Lok Sabha into a real forum to discuss matters of national importance. After his defeat in the next Lok Sabha elections, the death of Rammanohar Lohia and his own disillusionment with the state of the socialist party led him to quit the party and spend the rest of his life in attempts to create a genuine political alternative outside mainstream politics. Kishenji kept on exploring for the evolution of political instruments to bring in the real Socialist transformation. He was one of the founders of Lohia Vichar Manch, a forum of socialists who challenged from within the degeneration of socialist movement, the Samata Sangathan, a non-party political formation that sought to create alternative politics, in 1980. In 1990, he was instrumental in the formation of to the formation of Janandolan Samanvay Samiti, one of the precursors of the various attempts in recent times to create all-India networks of people's movements. By 1993, he along with other comrades, brought a large number of movement groups together to establish Samajwadi Janparishad, a political party that contests elections with a view to changing the mainstream discourse on questions of our time. However, he remained an ideologue and guide of the various peoples' movements, including the National Alliance for Peoples Movements and was active in attempts to create Peoples Political Forum, an emerging political formation. He wrote hundreds of essays dealing with contemporary India and the world. He served on the editorial board of 'Mankind' when Dr. Rammanohar Lohia was its editor. He founded and continued to edit Samayik Varta, a monthly Hindi political magazine, that has continued to come out regularly since 1977. He lectured all over the country and traveled extensively despite his frail health. Kishen ji was a model of honesty and integrity in public life. His wife, Bani ji, and he decided not to have kids, so that they could devote their lives to public service. Although he did not have any independent source of livelihood, Kishen Pattnayak did not accept the pension and other perks of an ex-MP till very recently when his falling health made it unavoidable. Both of them lived on the salary of Bani ji, a school teacher in Orissa. Kishen ji displayed no signs of envy or anger when his ex-comrades and disciples joined mainstream politics and rose to positions of power in national politics. At the same time he never sought to take advantage of their positions. Unusual for an Indian politician who entered the parliament in his 'thirties, Kishen Pattnaik did not acquire any property. We in the NAPM, fondly remember our respected comrade, guide and resolve to continue to strengthen clean, honest people's politics, with an equal emphasis on thought and action. We offer or condolences and solidarity to respected Baniji, his wife and lifelong associate. We all will cherish his memory- in our action and ideology. Kishen Pattnayak's death did not make headlines. Only one news channel ran this story on September 27, the day he died. Barring a couple of Hindi newspapers and the Oriya press, the national press ignored his passing away. This newspaper carried the news of the death of this "ex-MP" in about 100 words; other "national" newspapers could spare even lesser space. Clearly, our media that loves to hate politics had no space for the one politician who did not fit the stereotypes of a politician. Yet this is one politician who needs to be remembered and what better day than Gandhi Jayanti to look again at the politics of someone like Kishen Pattnayak. For starters, consider this fact: when he died he left no property. No house, no four-wheeler, no factory, no land, no plot. Rather unusual for someone who became a Member of Parliament when he was barely 32. He served the Lok Sabha only for one term and had no independent source of income thereafter. Yet he refused to accept the ex-MP's pension and perks before he turned 60. His wife worked as a school teacher and that is how the couple met their expenses. They decided not to have kids of their own, so that they are not forced into compromises. Recently, his wife built a modest house for them by saving from her salary and borrowing from her PF, exactly the way any other lower middle class person would have done it. Try speaking to "Kishenji" about his "sacrifice", and you discovered another respect in which this man defied the stereotype of a politician. He was most reluctant, almost shy, to speak about himself. There wasn't a trace of anxiety to prove his moral superiority and no desire to attract publicity for his acts of sacrifice. If anything, there was a matter of fact attitude about these things. He represented the last shadow of the Gandhian nationalist movement that trained its followers into believing that these were the done things. You needed to have good reasons not to follow this course. If all this creates in your mind an image of a simpleton Gandhian whose simplicity prevents him from registering a complex thought and whose honesty only serves to remind us that honesty is not the only virtue in this world, think again. Kishen Pattnayak was widely acknowledged as the most original political thinker the socialist movement in India had produced after Rammanohar Lohia. He edited two magazines: Samayik Varta in Hindi (being published regularly since 1977) and Bikalp Bichar in Oriya. The first edition of his book, Vikalpheen Nahin hai Duniya, sold out within weeks of its publication. Virtually all non-party movement groups looked up to Kishen Pattnayak for intellectual guidance. His thinking never suited the dominant orthodoxies of his time, right or left. His relentless focus on equality and readiness to take on the holy cows of nationalism troubled every establishment. Yet he was no Marxist and was therefore never acceptable to the Left establishment. He raised the question of the appropriate model of development, much before sustainability became the buzzword. He raised uncomfortable questions of caste, much before Mandal had forced the Left to come to terms with this phenomenon. Of late he had directed all his energy in interrogating another ideological holy cow: globalisation. No wonder he was not the darling of Delhi's intellectual circles, not even of its tiny Lohiaite faction that did not take kindly to his refusal to invoke Lohia every now and then. Here was clearly the stuff legends are made of. You would think that our media -- ever so keen to highlight the misdeeds of politicians -- would showcase this life of honesty, modesty and intellectual courage as a model of integrity in public life. But you could not be more mistaken than that. Barring a small band of (mostly Hindi) journalists who discovered him through personal encounters, he simply did not exist for the media. The record of the English media, the so called national press, was particularly poor in this respect. Their treatment of his death only symbolised how they treated him in his life, or the way they treat all the Kishen Pattnayaks of this world. No doubt he was not a model of political success. He spurned more than one offers of decent rehabilitation in the "political mainstream". His own efforts to create a viable political alternative to the mainstream were far from successful. A small band of idealist political workers and movement groups scattered all over the country followed him, but this did not form a critical mass that could generate a robust alternative that could take on the might of the established political parties. His last journey in Bhubaneshwar symbolised his political life: a small but emotionally charged crowd joined his funeral procession. Perhaps the only thing that invited local attention was the presence of many women in this funeral procession. A team of 21 persons, including five women -- representing his followers from all over the country -- lit the pyre. His wife gave the mukhagni. Let us ask ourselves a difficult question: was Kishen Pattnayak not successful in politics, at least partially, because the media treated him the way it did? What if the media had found a fraction of the space it devotes to the two big parties and their tamasha for Kishen Pattnayak's politics as well? What if the media could devote half the space it gives to the social dos and nakhras of Amar Singhs of the world to the "lifestyle" of hundreds of Kishen Pattnayaks that live in our country today? What if the media gave Kishen Pattnayak's speeches as much space as it does to, say, a Praveen Togadia or Bal Thackeray? Let us confront a disturbing possibility: could it be that the media and the middle class that drives it did not wish to know about Kishen Pattnayak? Perhaps because he held a mirror that all of us did not want to look at? Perhaps because his image spoilt the simple pleasures of politics bashing, our national sport after cricket? Perhaps because he reminded us of the Kishen Pattnayak within ourselves that we desperately wish to forget? Samajwadi Janparishad is a political party registered with Election Commission of India.It has units in 10 states of India.It believes in Gandhian Socialism.It is a constituent of National Alliance of Peoples' Movements.Sunil,At/P.O Kesla,Distt. Hoshangabad,M.P. is all India General Secretary of the party.Vinod Prasad Singh is all India President of the party.The party believes that Globalisation is a counter-revolution and hence opposes it. The Norwegian unit of giant drinks maker Coca-Cola is fighting efforts by a local aid group that's urging consumers not to buy Coca-Cola products. The aid group claims Coca-Cola first must compensate farmers in India for allegedly damaging their water supply. Norwegian Church Aid (Kirkens Noedhjelp) claims that thousands of farmers in the Indian state of Kerala have lost their livelihoods because of Coca-Cola. The group claims Coca-Cola has used up vast quantities of groundwater and polluted it as well. It's urging consumers not to buy Coca-Cola products until Coca-Cola finances a compensation plan for the roughly 10,000 affected Kerala farmers. Coke machines were moved out of Norwegian Church Aid's offices in Oslo earlier this month. But Coca-Cola Norge says Norwegian Church Aid's protest action is misguided and uninformed. "Norwegian Church Aid generally does a very good job, but in this case, it's based its action on erroneous and poor information," claims Stein Roemmerud, communications director for Coca-Cola in Norway. Roemmerud claims that groundwater levels in Kerala have sunk dramatically since 2000, along with the number of days with rain. "It's an oversimplification to believe that a single plant can cause this," he said. "Our daily water consumption is 400,000 liters, but the plant is currently shut down." Roemmerud notes that Coca-Cola doesn't have the only plant or factory in the area, either, saying there are 27 firms within a 5-kilometer radius. "All of them use groundwater in their production, and around half use more than our plant," he said. "We interpret that as a sign that this is as much a political issue as an environmental one." Mammootty backs out of Coke ad! Mammootty who had signed up to endorse Coca Cola in Kerala has suddenly developed cold feet after pressure started mounting from CPI (M) and other left organizations. Several environmental groups had called for a ban on coke in Kerala and had tried to close down its bottling plant in Plachimada in Palakkad for sourcing water. So Mammootty under orders from the party bosses had issued a statement as the Chairman of the CPI (M) controlled Kairali TV- "I was away from Kerala in connection with shooting and the controversy came to my notice only on my return". It is obvious that Mammootty has backed out of his commitment with Coke, as he does not want to strain his excellent equation with the party bosses in Kerala." According to the grapevine Mammootty had shot the Coke ad in Mumbai by a very famous ad filmmaker. Well then that is Kerala for you, where political parties especially the CPI (M) do not approve of private enterprise. I have come to attend the 4th WSF as an observer and in the capacity of a member of the NAPM (National Alliance) of People's Movement, India) My political organisation SJP (Samajwadi Jan Parishad), whose ideology can be called socialism as modified by Gandhism, is not very enthusiastic about the world conference. Neither does it reject the WSF as wholly irrelevant or reactionary. A practical reason for SJP not carrying out a strategy to take part in WSF is that participating effectively in this conference is financially in this conference is financially unaffordable for the SJP. I have decided to come and attend because I can afford to travel to the venue and spend a week here. the next the future world conference will be held in far away countries. Going there will be beyond my means. I did want to miss this one. My curiosity is positive. A few groups in India with whom I have good relations are mobilizing a resistance (Mumbai Resistance, MR 2004) to the WSF. They have some serious allegations against the character and compositions of the WSF. I cannot subscribe to these allegations even though a few of them are not unfounded. A brochure published on behalf of Resistance goes to the extent of alleging that the protagonists of globalization have actually initiated the WSF process with a view to taming the anti-globalization wave. This statement is either absurd or irrelevant. What is important is not who started and with what intent, but how the process in being carried forward, and with what outcome. Recent events in the world have shown that inspite of the universal discontent against Globalization there is hardly any organized, continuous resistance to the imposition of anti-people economic policies that almost all the nations are experiencing. Outside Latin America. people's anger against economic imperialism is nowhere reflected in the nations' politics. In such a situation of inaction any organisation or institution which brings together, periodically, critics of globalization from all corners of the world is doing us good simply by providing opportunities of solidarity. Critics my be just critics, they may not even be antagonists. The motto "another world is possible" does not deter them so long as the contents of change are not deeply debated. The question at this stage is not whether opportunistic elements have infiltrated into the WSF. We have to search out whether some healthy, genuinely radical trends are gradually making headway and an international force against globalization is taking concrete shape as a result of the solidarity and interactions over the past four years. Is there a real sense of arriving at a world-wide consensus on radical policies which will inspire people of various countries not only to resist globalization but also to articulate the outlines of new economic society based on the principles of equality ? The overwhelming presence of the NGOs, liberally founded by donors of rich countries, is a major source of worry, I don't know if NGOs of other perceived by radical groups as the agents of western capitalism. This is an embarrassing subject because so many of our deal and esteemed friends are part of the NGOs. This is an embarrassing subject because so many of our dear and esteemed friends are part of the NGOs. Perhaps they have to be kept there to impart a progressive image to the organisations concerned. Sometimes it may so happen that one or two personalities associated with a NGO are incorruptible and beyond reproach, but the bulk of the activities and managers belong to the average run to NGO cadre. The NGOs, by the large, have to function within the development objective set by the World Bank. When Radical movements are going on in the society, the NGOs may associate with anti-establishment agitation in order to save their progressive credentials. This is remarkably illustrated in radical situation when movements are totally absent. If the USA is supporting a military rule and there is no political force there to resist it, the NGOs also tend to forget about democracy. Globalization with a human face, capitalist development accompanied by programmes of eradicating poverty -this is the ideology if NGOs in the developing countries. Needless to say, some of them can easily be covered into agents of the establishment against revolutionary and patriot movements at crucial times. Therefore it can be said with apologies to those elements in the NGOs who are genuinely radical, that the resentment against the disproportionate presence of NGOs in the WSF is not without valid reasons. It is natural for groups starved of funds to be suspicious of NGO delegates who spend money on their travel, accommodation and activities in a manner similar to what government and corporate delegates do. It may be asked if it is bad to have more money ? This is a serious question. Some organisations, like mine, may be inefficient and incapable of collecting funds for meeting the minimum needs of functioning effectively. But even the best of the organisations in a poor country will find it hard to make both ends meet if it has to remain independent, radical and uncompromising. The deplorable aspect of the fund of eminent NGOs, is that all the funds come from outside. The local society does not contributes at all. When the personal lifestyles and organisational expenses do not reflect any of the constraints of poverty that pervades all around, that itself becomes a source of suspicion, a potential for future compromises. It is another thing that NGOs cannot be wished away. But their limitations must be kept in mind while coexisting with them. The NGOs may constitute the majority of the delegates to the WSF. But is there also an assertive minority consisting of the genuinely radical elements ? No doubt they are there, but are they visible, as distinct from the NGO crowd ? Discussion on environmental damage, gender inequality and racial prejudice are commendable exercises, and must find a place in the radical ideology. But the WSF will be credited with a special role only if it devises a strategy for fighting against the economic globalization of poor countries, which means fighting against the WTO, World Bank and IMF-against world capitalism in short. Is this question central to the deliberation and activities of the WSF ? Most of the critics of globalization who attend similar conferences are hesitant to clarify if they really oppose the WTO, and if they have a programme to end capitalism and its global integration. The euphoria around Cancun exposed that the concessions are granted to the weaker nations. In this context. the slogan, "Another world is possible" doe not hold much uttered first, If you go on repeating the slogan without concretizing the change that is visualized, it loses the original ethos. It may not mean anything after some time. The failure of the WSF is the failure to initiate a credible process of formulating a strategy for opposing the world economic system. By not some economic goals should have been laid down and popularized. It has not even been established whether economic equality is a valid idea as part of the goal of drastically reducing the disparities between nations, regions and classes. If disparities are to be done away with, what happens to prosperity ? For prosperity without any limit means basically the centralizing wealth and production. Modern technology specializes in centralizing wealth and its production. So ending inequality will necessitate a radical change in the use of technologies. The leftists of the twentieth century, the socialists and communists could not resolve this dilemma. So they met a dead end. The WSF will have to being where twentieth century socialism stopped. It not only stopped, it collapsed under the weight of unanswered questions and unresolved contradictions. It could not reconcile the pursuit of modern prosperity will the goal the economic equality. The lure of prosperity and modern technology is so great that successful socialists everywhere have bowed to the market and postponed the ideas of equality. Organizing struggles is one part of resisting globalization, but the other part is ideological. If a party or coalition of parties is able to gain popular support and comes to power in a developing country on the promise of fighting globalization, how does it put this into practice ? What should a patriotic, anti-imperialist government do in respect of foreign capital and foreign loans ? If the goal is to achieve modern prosperity, the country may need more loans and more foreign capital. Then its dependence on foreign powers and centres of world capitalism will increase. Will the WSF advices such a government not to go in for modern prosperity. Take the example of my own state, Orissa. It is a very poor and backward state, but it has rich bauxite deposits. Aluminum multinationals are ready to come and make Orissa a source of great wealth. Globalization has promoted the government of Orrisa to invite the multinationals. But the tribal inhabitants have resisted, and managed to prevent this mining in a number of cases. If they yield they will be wiped out. They will never get back a satisfying community if they agree to be displaced. Will the deliberations in the and government on this issue, but may not be more about displacement and less about mining itself. What has mining done to the people everywhere ? What has mining done to poor and backward regions like Orissa ? And what has it done for the powerful nations? A fundamental questioning of the basic assumptions about mining will raise new ideological questions. One of these is whether mining should be stopped altogether in regions like Orissa, at least for the present period. Critics of globalization may not like to debate on this. Every leftist inheriting the 20th Century mind-set will say, "Mining is inevitable". This statement breaks the barrier between rightists and leftists. It is the modern mind, addicted to the idea of great prosperity and centralized wealth, which unites them. Even MR 2004 which is opposing the WSF may be different on this question. Why should mining be inevitable ? How much of the annual production of Aluminum goes to boost the war industry and the luxurious living of the rich ? If war and luxurious are not inevitable, why should mining be inevitable ? Can we not reduce mining to its one hundredth part? It mining is reduced to a bare minimum it will be qualitatively a very different thing. It may lose the cruelty and glamour associated with modern mining. The 20th century radicals did not bother about this aspect because they tended to believe that you can use modern technology anywhere you like and produce great wealth and then distributed that wealth by using state power. This illusion has been belied, but no proper debate has yet taken place. We know now that we cannot acquire the technology unless the multinationals are willing to give it. They do not give it cheaply, so when we start using the technology, the mining process itself gives rise to so many inequalities. In non-technical language, globalization means integrating the developing economies with the world's most powerful economies. This process benefits the powerful economies in a total manner, and it is they who take all the initiatives. Others either okay the proposal or seek concessions and moderation. Whenever the superpowers concede in a small way, it is considered a big achievement for the poor country. Is the WSF, or some significant part of it, going to take a stand NOT to integrate poor countries' economies with the most powerful economies ? If it does, it will have to give a call to the developing countries to quit the WTO. A debate on this is not yet on the agenda of the WSF. 1. We should advocate a policy of quitting the W.T.O. 2. Patriotic governments of developing nations should adopt a policy to stop asking for loans from the World Bank / IMF. 3. The whole world needs a civilization change, marked by the reduction of economic disparities between nations and classes. Towards this, the WSF should strengthen and sharpen the concepts of (1) small and appropriate technology and (2) self-reliant communities which will produce all basic necessities of life in their own respective regions. 4. There should be no global trade in articles of daily necessity that can be produced in every region. Even trade within the nation should adopt the economic philosophy of self-reliance of the communities. 5. Trades and markets desist from multiplying human wants and commercializing the basic elements of nature like air and water. 6. Mining must be drastically reduced so as to bring about a qualitative change in its impact on people and business. And so on. The WSF should provides an atmosphere for the launching of a strategy of ideas and actions that will define a break with the old order the concepts that shaped it, " Another World" must mean another civilization. The same appeal is extended to Mumbai Resistance 2004 (Mr-4). We are not convinced that Mr-4 is armed with a vision that will replace the present global economy. Centralization of wealth production and the desire for limitless prosperity was the economic aim that inspired both America and the Soviet Union in the20th century. America has now risen to the status of a global empire, and the Soviet Union has collapsed. The peoples of the world, especially those of the third world, need a new philosophy of sustainable living and sustainable production. Without this basic component, socialism cannot be revived in the 21st century. So both MR 2004 and the radicals inside WSF are facing the same challenge. NEW DELHI - In view of an impending water crisis, environmental activists will hold a protest rally in north India next month to enlist support for ousting beverage multinationals like Coca Cola, accused of polluting and exploiting scarce groundwater. A protest rally will be held in the north Indian city of Varanasi next month to highlight the role of Multi-National Corporations (MNCs) such as Coca-Cola in the looming water crisis, the organizers say. The protest is led by two local organizations, the Lok Samity and the Samajwadi Janparishad, members of the National Alliance of Peoples' Movements, an umbrella body of environmental and other social groups. The activists are protesting against a Coca-Cola plant located in Mehdiganj, some 20 kilometers from Varanasi. They claim that the plant draws electricity from two diesel power generators, one of which consumes 360 liters of diesel per hour. Two tube-wells draw thousands of liters of underground water. "The consumption of underground water by the company has led to a lowering of the underground water level from 15 to 40 feet," says Aflatoon, state general secretary of the Samajwadi Janparishad. The activists, who claim the factory disgorges toxic industrial waste into neighboring fields and mango orchards, continue to urge the government to revoke the plant's industrial license. "Many expelled workers of the plant who are with the movement, say the pollutant, Caustic Soda -- used for washing bottles, is causing the environmental damage," says Aflatoon. According to Aflatoon, people living in villages around the plant often break out in rashes on drinking the water. Worse, the water has damaged wheat and paddy fields and the chick-pea crop in the region, he alleges. There are other negative fallouts. As Aflatoon points out, "Polluted water stagnating in the fields has become a breeding ground for mosquitoes, causing Malaria." He goes so far as to allege that, "A village dog died after drinking the water." According to Aflatoon, the destruction caused by the pollution from the factory has forced local farmers to organize themselves and demand ' Cola Bhagao, Gaon Bachao '(Oust Coca Cola, Save the Village). Petitions have been sent to local officials as well as the President of India demanding the ouster of the MNC, which was earlier asked to leave the country by the Indian federal government in 1977. Coca Cola withdrew from India after the Indian Government demanded it reveal the formula of the popular drink. It made a comeback in 1993 after New Delhi initiated a process of economic reforms. The American MNC is today one of the biggest foreign investors in India. Last month too, environment activists held a protest march in Varanasi, following which the local administration ordered an inquiry into allegations of water pollution caused by the bottling plant. The Varanasi protest comes in the wake of a similar movement in Kerala in south India last year. Last summer, villagers in the Palakaad district of Kerala demanded the closure of the Hindustan Coca-Cola Beverages Private Limited, a local unit of the MNC. The villagers held that the MNC had dug up borewells for its water requirements, causing wells and ponds in the area to dry up. After a two-month-long protest, the local administration revoked the license of the Coca-Cola factory in the state. Currently, the lowering of ground-level tables is causing severe water crises in different parts of the country. India's capital, Delhi, tops the list of water scarce cities, followed by Mumbai in the west and Bangalore and Hyderabad in south India. The situation, experts warn, is likely to worsen in the coming years. According to Indian government figures, areas with access to water supply in Delhi will plummet from 81.5 percent to 26 per cent in the next 20 years. The Central Pollution Control Board (CPCB) has directed its Regional Officer in Uttar Pradesh to enquire and take action on a report by Aflatoon, State General Secretary of the Samajwadi Jan Parishad, detailing the pollution caused by Bharat Coca Cola Bottling North East Private Limited - an Indian arm of Coca Cola - in Mehdiganj, Uttar Pradesh, 20 km from the holy city of Varanasi. 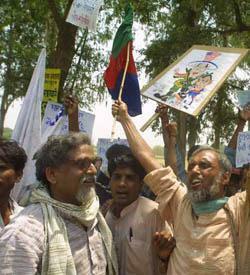 This significant development on 26th June, 2003, is an outcome of sustained protests against Coca Cola. On the 10th of May, 2003 about 100 people held a demonstration at the plant gate. Nearly 200 police personnel were deputed by the district authorities to 'protect' the plant along with 50 gun toting private security guards. While this agitation was suppressed by beating up the demonstrators to disperse them, local inhabitants are geared for a long struggle against the cola giant. Village level meetings and training of youth for non-violent direct action are underway. Sajha Sanskriti Manch -- a platform comprising the Samajwadi Jan Parishad and several other peoples organizations, women's groups and human rights organizations in Varanasi -- has submitted a memorandum to the District Magistrate, demanding cancellation of the industrial license of the bottling plant. About 300 activists of the Manch demonstrated again on July 4th at the district headquarters to demand cancellation of the license of the Coke bottling plant. Despite the rain, the activists, who had come on bicycles from surrounding rural areas, went ahead with the protest action. Pressure has been building up since early May when a local court found the company guilty of evading payment of land revenue worth Rs 1,50,7500 [US$ 31,406]. An equal amount of penalty -- under Section 47 A of Indian Stamps Act -- has also been imposed on the company. The case, filed in April 2001 by the Uttar Pradesh Government, was the outcome of lobbying by local residents. The verdict takes note of the fact that the company has illegally occupied a portion of Common Property Resources of the village. To add insult to injury, the company enjoys subsidized rates for electricity since this illegally occupied land is agricultural land. Coca Cola, which left India in 1977 when it was asked to reduce foreign equity, came back to India about two decades later when it took over the Parle soft drinks plant of Kejriwal Beverages Pvt. Ltd. which was bottling Thums Up, Limca and Gold Spot. The plant, built in 1995 on almost seven acres of agricultural land in Mehdiganj was taken over by Bharat Coca Cola Bottling North East Private Limited in February 1999. The plant does not draw electricity from the Power Grid Corporation, but functions on power generated by two massive diesel generators. One of the generators consumes 360 liters of diesel per hour. Two tube wells run 24 hours to draw hundreds of thousands of liters of ground water. Every hour, a truck carrying 550 crates of bottled soft drinks leaves the factory premises. The plant has about 60 permanent employees and almost 400 contracted labor. The salary of the general manager of the plant is Rs 120,000 per month (approximately US$ 2400) whereas a worker gets Rs. 66 (about US $ 1.3 per day). Many of the workers are weavers who were rendered jobless when power-looms gradually replaced handlooms for weaving the famous Benarasi sarees. Local residents say that young people of the village were promised permanent jobs, but these promises were not kept. The plant was disposing its effluent into the nearby canal which emptied into the River Ganga. Since the past few months however, the hazardous nature of the waste became apparent when due to construction of a super highway, the pipes to the canal were dislodged and the factory began to dispose toxic industrial waste into the neighboring fields and mango groves. Coca Cola officials claim that the plant is fitted with eco filters but residents allege that the waste is hazardous in nature. Solid chemical waste is also being dumped in nearby fields. The total area submerged by the factory waste is about 20 acres. Grass in the submerged area, as well as crops of wheat, paddy and chickpeas have been destroyed. Some huge trees, including neem trees, have also dried up. Additionally, the polluted water causes rashes on human skin, say local residents. Polluted water stagnating in the fields has become a breeding ground for malaria spreading mosquitoes. Heavy consumption of groundwater by the company has lead to lowering of the groundwater level from 15 to 40 feet. Drinking water was earlier supplied through a pipeline from neighboring Bhikharipur on the other side of the highway. This was disrupted due to construction of the Golden Quadrangle the World Bank funded super-highway linking the metropolitan cities. Villagers are now totally dependent on hand pumps for their daily needs, and are thus directly impacted by the water scarcity. The villagers ire is fueled by their assessment that some political leaders have been instrumental in helping the company's illegal work by pressurizing local administrators. Local people allege that they received large sums of money from the company for such favors. The public relations exercises of the Coca Cola Company has further incensed local residents. For instance, the company once sent its bus to bring the neighborhood school children for a visit to the plant with an offer of serving them free Coke, but the school authorities refused. The local Member of the Legislative Assembly (MLA) distributed pencils and erasers in Fanta cans to schoolchildren. Three tricycles for physically handicapped have been distributed by the local M.L.A. These tri cycles carry Coca Cola iceboxes fitted on them. Efforts to organize the contract workers have so far met with oppressive measures. Five workers were imprisoned on false criminal charges filed by the company. Destruction caused by the pollution from the factory has galvanized local farmers to organize themselves and declare 'Coca Cola Bhagao, Gaon Bachao' (Save the Village, Chase Away Coke). They have sent petitions to all concerned authorities from the local District Magistrate to the President of India. Organizations like Samajwadi Jan Parishad, Lok Samiti and Sajha Sanskriti Manch have sustained the pressure, forcing Coke to respond. The company has now started construction of a kilometer-long pipeline to dispose waste. With the CPCB also inquiring into the matter, it looks like Coke may have to make more drastic changes than mere public relations exercises. Aflatoon is the State General Secretary of the Samajwadi Jan Parishad. Soft drinks giant Coca-Cola has been ordered to stop extracting ground water at a plant in southern India. The High Court of the state of Kerala gave the firm one month to close its bore wells at the plant in Plachimada. A village governing council had complained about overuse of water and had filed a writ challenging bottling operations. However, the court also ruled that the council had no authority to close down the bottling plant. Kerala High Court Justice K Balakrishnan Nair granted Hindustan Coca-Cola Beverages Limited one month to close down its wells and find an alternative source of water. But the judge also directed the village council to renew the licence of the plant and restrained it from interfering with the functioning of the factory. The council's writ had challenged an order by the state government that permitted the functioning of the bottling plant in the area. The court observed that ground water was a national resource that belonged to the entire society. It also pointed out that the Supreme Court had stated in earlier orders that underground water belonged to the public and the state should act as a trustee for its protection.